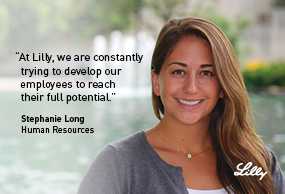 Our sales team delivers vital health care solutions to people in need around the world. As a world-class company known for its innovative medicines, we are dedicated to ensuring these needs are met through creating positive experiences for our customers. In our culture of innovation, teamwork and professional development, you can expect great things today and in the future. Sales positions at Lilly offer a path to positively impact people’s lives, while enhancing your future with solid training, professional experience and an exceptional benefits package. By signing up for job alerts, you'll be the first to learn about opportunities that could be a great fit for you via periodic email updates. Interested In Personalize your job alert by adding a Category and/or Location. Info about Lilly Sales Internship Program. Our Promise to make life better is about helping others fulfill the individual promises they make in their own lives. Eli Lilly and Company, Lilly USA, LLC and our wholly owned subsidiaries (collectively “Lilly”) are committed to help with individuals with disabilities participate in the workforce and ensure equal opportunity to compete for jobs. If you are an individual with a disability and require a reasonable accommodation to participate in the application process for positions at Lilly please email Lilly Recruiting Compliance for further assistance. Please note, this email address is intended for use only to request an accommodation as a part of the application process. Any other correspondence will not receive a response. Lilly is an EEO/Affirmative Action Employer and does not discriminate on the basis of age, race, color, religion, gender, sexual orientation, gender identity, gender expression, national origin, protected veteran status, disability or any other legally protected status. It has come to our attention that there has been fraudulent activity by scammers representing themselves as Lilly recruiters. They are potentially using e-mail addresses that contain "@lillycareers.org." Lilly recruiting correspondence should come from a recruiting representative with an official Lilly.com e-mail address. If you suspect that you are being contacted by an unauthorized recruiter or agent of Lilly or believe the offer is suspicious, you may e-mail your concerns to our security department at globalsecurity@lilly.com. You may also report suspicious fraud attempts to your local law enforcement agency or the FBI.